It’s a very pretty bottle, too… although I’m not sure it’s as functional as the 4001 container. While Pelikan’s 4001 inks are the company’s quotidian workhorses, the Edelstein line was introduced to thrust Pelikan into the relatively recent boutique ink market. 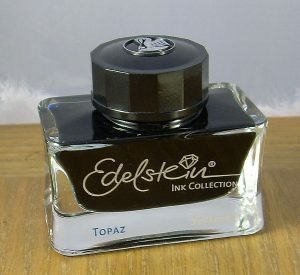 As is the case with other pen-maker’s boutique inks, my personal opinion regarding the Edelstein line is split into warring camps. They are very nice in terms of writing quality, as they should be given that the box describes them as “extra soft ink”, and the colours are quite pleasant. Opposing this is the startling cost of a bottle, which is something like triple or quadruple a similar volume of plain old everyday ink. I wouldn’t have any, to be honest, if I hadn’t got it for free as Pelikan Hub giveaways– but my income level isn’t that of the sort of person boutique inks are aimed at in the first place. I can say that my M600 really, really likes them. Olivine: On a less absorbent paper than I use for my ink samples, this ink produces some lovely dark shading. On lesser papers, it is reduced to a simple medium-tone green. This is the Ink of the Year for 2018.